Source: Holiday Origami by Fumiaki Shingu. His website is origami-club.com. 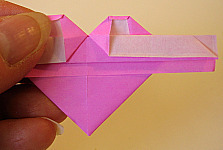 Mr. Shingu uses this origami heart as a box decoration. We’ve invented a few more uses for it, such as a ring and scarf holder. It can also be used to make Valentine cards, as described on our Valentine’s Day Projects page. Something nice about this origami heart is that the colored or patterned side of the paper shows in the front slit, rather than the white side, since it tends to spread apart when used as a ring. 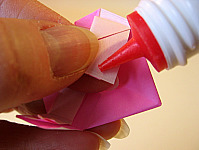 It calls for paper ¼ the size of a standard 5 7/8 inch (15 cm) piece of origami paper, or about 3 inches square. Of course, you can make it any size you like. See our cutting tips page and/or Sarah's page for tips. 3. Fold two opposite sides in to meet in the middle. 4. Turn over and orient as shown. 5. Fold the two lower corners up to meet the top edge. 6. Turn the model over. Notice the long, skinny rectangle. 7. Grab all of the layers of the rectangle at the top edge and fold down about 1/3 of the way. Tip: Folding a third can be tricky. Try this: Start as if you were going to fold the rectangle in half, but then back off a bit before creasing. And, don't worry it doesn't have to be exact. 8. Working under just the top layer on one side, slide one index finger toward the middle to form a little pocket. 9. With the other index finger, squash-fold the pocket into a tiny triangle. 10. Repeat the squash-fold on the other side. 11. Fold down the two new corners even with the top of the tab. 12. Turn the model over and look the heart you’ve made. 13. If the tops of heart lobes look a little pointy, you can fold the very top edge of each lobe down a tiny bit to give them a more rounded shape. 14. Fold in the tabs as far as they will go without tearing. 1. For a ring, put the heart around the intended finger to see how far the tabs need to overlap to fit correctly. You might need to make the ring larger for a scarf holder. If so, add an extender: a strip of paper the same width as the tab. To make the extender strong, use a piece of paper folded in thirds. 2. Use quick drying adhesive to glue the tabs together to form the ring.